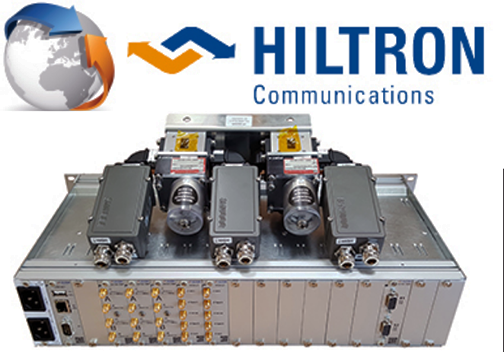 Hiltron Communications has added to the firm's SATCOM product range with the introduction of the Hiltron Redundancy and Monitoring Unit (HRMU). The HMRU is based on the proven design of the Hiltron HCS4 controller generation and is tailored to manage different control applications for commercial Earth stations. The system is configurable to manage redundant groups of equipment such as low noise amplifiers, low-noise blocks and block upconverters. Its redundancy control function, including automatic switch-over to standby/off-line units, is triggered by configurable thresholds for voltage, current and signal strength. Additional features offered by the HMRU include RF level detection, DC supply to LNBs and monitoring of L-band signal strength, with configurable thresholds. LNB control functions include voltage adjustment and 22 kHz tone generation in up to four bands for each polarity setting. Split unit operation can be employed for fiber-optic links, allowing separate L-band switching with monitoring of most of all commercially available fiber-optic converters. The HMRU can be operated under IP-based control from any PC, its graphical user interface being compatible with standard web browsers. An Ethernet interface is provided for monitoring and control via SNMP. The HRMU is available in a 19-inch rack mounting version or IP65 outdoor cabinet containing the fiber optic LNBs and the switching system plus a master controller. The master controller is normally installed at the antenna hub where it provides DC power as well as control data to the LNBs and waveguide switches. It can also distribute an externally or internally generated GPS-synchronized 10 MHz signal. Suitable for use over a temperature range of 0 to +50 degrees C (IP65 outdoor cabinet -20 to +50 degrees C) and humidity levels of 5 to 95 percent non-condensing, the HMRU operates from 95 to 245 volts AC, 47 to 63 Hz, and consumes a maximum of 1 amp current at 230 volts. Maximum output power is 90/180 watts. The Hiltron Redundancy and Monitoring Unit will be introduced on the Hiltron stand, 5.B80, at IBC 2018, from September 14 to 18.